One of my coworkers, the most friendly, helpful guy you could hope to know (and a computer whiz, to boot), recently mentioned that he is on insulin but is still having difficulty keeping his Type 2 diabetes under control. I was a bit surprised, as he is tall, exercises (not only goes to the gym but also has a job that keeps him running around our building like a banshee all day) and is not morbidly obese like me. I related that I’ve had reasonable success at controlling my blood sugar since I went vegan a little more than two years ago. He seemed busy, but I spent a minute or two explaining about the vegan diet before he had to run off to put out the next fire at work. Funny thing is that there is no one “vegan diet.” Every vegan eats differently. The baseline that most of us have common is that we do not eat animal products. This includes a ban on meat, fish and seafood, dairy products (milk, cheese, etc. ), eggs or honey. As most Type 2 diabetics know, the finest foods in life are starches. I knew that even in my carnivore days. When you have to watch your carbs, it is easy to dream about bread, potatoes, bread, pasta, bread, cereal, bread, bagels, croissants and tortillas. Did I mention bread? Most of these beloved starches are vegan (although you always have to watch the ingredients on the labels of commercially prepared products). But those of us who are both vegan and diabetic are faced with a double challenge. It is easy for vegans who eat on the run to overdo it on the starches, a disaster if you’re a Type 2 diabetic. So I’m not surprised that among the most common questions that I’m asked about my vegan diet is how I get my protein. “You don’t even eat eggs?” my coworker asked me. I know where he’s coming from. As I’ve been blessed with naturally low cholesterol, I used to eat a lot of eggs. If I had a boiled egg (or two) for a snack, at least I didn’t have to add it to the carbohydrate tally for the day on my diabetic diet. A single egg gives you 6 grams of protein, so egg lovers who go vegan will likely need to search for a replacement source of protein. Don’t ask me how much protein you should consume each day. I have no idea. For one thing, it’s an individualized thing in that it supposedly depends on your body weight and how much you exercise. For another, there appears to be little consensus among the medical community regarding how much protein we need. Lots of folks out there wag their fingers at meat-loving Americans, warning that we’re getting too much protein and that this can cause us to gain unhealthy amounts of weight and even result in kidney disease. Then there are others who believe that we don’t get enough protein and would, in fact, do better to indulge in more as a replacement for a lot of the refined sugars and starches that Americans are so enamored with. All in all, however, I believe we’re probably better off dumping the excess carbs and replacing them with vegetables (both the green and orange varieties). Starch does have its place, however, even for vegan Type 2s. It’s a matter of achieving balance, which I grant is not the easiest thing when you spend your life running hither and yon. I am definitely not a good role model in the area of balance, as I seem to have developed a potato fetish on a scale that would be funny if it weren’t so sad. As far as I’m concerned, a day without potatoes is like a day without sunshine. If I don’t have my baked potato, I get positively grumpy. But you know what? A baked potato (if it’s not a giant one) tends to have about 90 to 110 calories. You could do worse. And starches do fill you up, which can leave you less hungry for the junk food that is forever calling my name. In this last category I include items such as vegan burger patties (Boca burgers, for example) and veggie dogs, vegan “lunch meat” (my favorites are Yves “bologna” and Tofurky’s “oven roasted turkey”) and vegan frozen items (my favorites are Gardein’s “fish,“ “chicken” and “meatballs” and Amy’s bean burritos). These convenience foods are probably not as healthful as whole foods such as beans and legumes, but they taste great and I never have to worry about a quick protein source to throw in my bag. A few minutes in the microwave at work and lunch is served! Of course, protein choices have to be modified to personal preferences. For example, I happen to detest seitan (sprouted soy), which, at least to me, tastes like dirt. I rarely drink soy milk, as I prefer almond milk, which has very little protein (but is wonderful in a cup of hot Earl Grey). I do, however, enjoy tofu and beans, particularly chick peas (which here in California are popularly known as garbanzos). Everyone has to come up with the mix that works for them. It’s particularly tough for those transitioning from a meat-eating lifestyle, because many of these products may be totally foreign to them. It’s also worthwhile to bear in mind that many foods that you already eat contain protein that you might not be aware of. A packet of instant oatmeal, for example, which I always think of as a starch, typically contains 3 grams of protein. If you throw two of those in a bowl with some hot water in the morning, you have the same amount of protein as there is in an egg. The bottom line is that protein is not at all difficult for vegans to come by, particularly with all the commercial products available on supermarket shelves these days. I just hope that my coworker decides to give it a try. My mother told me a lot of stories when I was growing up. Some made me roll my eyes with the morals they were meant to convey and others I just plain couldn’t believe. But then there were some that I never got tired of hearing no matter how many times she repeated them. Most of these had something to do with Yiddish words or with the intricacies of observance in the Jewish faith. This wonderful story came to mind while working on my memoir recently, when I got to the part where I was describing my dislike for the lunches that were served at the yeshiva (Orthodox Jewish school) that I attended in my elementary years. Most days, I brought a sandwich from home, which suited me just fine. Thinking about the school lunches, I remember how heavily breaded the dry fish cakes were. But most of all, I remember how much I disliked the tomato soup that was often served. “What’s wrong with the tomato soup?” my mother would ask. “Is it too sweet? Too salty?” At the age of eight, I couldn’t come up with a coherent explanation. I just couldn’t put my finger on it. The bottom line was that it just wasn’t like the tomato soup that my mother served at home. Years later, I came to realize that the school’s awful tomato soup was homemade, while my mother’s delicious soup was Campbell’s out of a can. My mother bought Campbell’s because her mother did. Both of them kept kosher. Neither had any idea that the “natural flavors” listed in the ingredients include meat juices left over from processing dead cows and pigs. Like the young husband in my mother’s story, I had no idea that my “kosher” food at home was anything but. I experienced a similar situation when it came to cheese, which was once among my favorite foods. I mainly grew up on processed American “cheese,” packaged Swiss cheese and cottage cheese. My father loved to indulge in tiny bricks of “smoky cheese,” which he particularly enjoyed on apple pie. I would taste it and fail to understand how anyone could stomach the stuff. As an adult, I branched out and learned to love feta, bleu cheeses, Brie, cheddar, gouda and provolone. Over the years, my parents became more adventurous as well, and they now regularly enjoy Muenster and Havarti. Well, wouldn’t you know it, I got schooled once again, this time courtesy of Trader Joe’s. About five or six years ago, I was shocked to discover that, right there on the label of some of TJ’s most delicious cheeses, the ingredient “animal rennet” was listed. Now I understood why the Orthodox Jewish friends of my childhood would only eat Miller’s kosher cheese. After my lesson from Trader Joe’s, I gave Miller’s a try and found the taste to be disgusting. Apparently, you had to use the scrapings from the stomachs of cows and sheep to get the enzymes that made cheese taste so delicious. It was Campbell’s tomato soup all over again! I related this sad information to my parents, to no effect. As far as my mother is concerned, cheese is dairy and therefore kosher. Oy. When it comes to flavor, it seems that most of the time non-kosher wins. After I became a vegan, I learned that excellent minestrone soup can be made using vegetarian tomato sauce and fresh vegetables. My wife is a master at this. I also learned that bland food can easily be flavored with any number of spices, no meat juices needed. My go-to spices are black pepper, garlic powder, onion powder and oregano. I also use mustard (both yellow and Dijon), lemon juice, green salsa (I don’t much care for the red), pepperoncini and jalapeños. For baked yams, cinnamon is a must. And then there is vegan margarine, olive oil, vinegar and soy cheese to flavor vegetables. Even tofu, which many won’t eat due to its bland nature, is delightful when doused liberally with spices and baked. My favorite vegetable remains the eggplant, which I learned to love as a teenager when my father would take me out to little Italian joints for eggplant parmigiana. My wife still prepares this for me regularly. She slices the eggplant, I douse the slices with canned tomato sauce and spices, and in the oven it goes. About 40 minutes later, I apply slices of soy cheese to get nice and melty. Just as in the case of tofu, many won’t eat eggplant because it is bland. Believe me, it’s not bland at all when I get done with it. Garlic rules! Years ago, I learned that eggplant, like tomatoes, are nightshades; for a very long time, both were thought to be poisonous. But what I didn’t know (until we saw it on the Cooking Channel the other day) is that eggplant is, of all things, a berry! How can something as large and lovely as an eggplant be compared to a little strawberry or blackberry? Strange how nature works. Even worse, however, I learned this week from Jeff Guo’s Wonkblog entry in The Washington Post that the eggplant emoji is suddenly enjoying a spate of popularity. Initially, I was delighted. I had no idea that my favorite vegetable, er, berry, had, in all its purple glory, found its way into the land of text messaging. That’s when I learned that (gulp) the beautiful eggplant emoji has, uh, a sexual meaning. Now why would anyone go ruin a thing of beauty by smutting it up like that? Gutter minds notwithstanding, the eggplant emoji will continue to bring a smile to my face. Please feel free to send it to me anytime. But only if it means you’re inviting me to dinner. I’ll bring the soy cheese. My father keeps telling me about how much he likes the work his barber does. Now, Dad has very little hair left at this point, so it’s not as if I expected his barber to be a corn row connoisseur or a faux hawk aficionado. But when he told me that his barber charges only four dollars (plus tip), I was sold. I decided to put up with my sideburns for a couple of months in order to get my ears lowered both competently and cheaply when I headed south to visit my parents for Thanksgiving. On Black Friday, my wife and I drove from my parents’ house out in the country to “the big city” of Fresno to get coiffed. (Well, really so my wife could use her computer to get some work done, since there is no high-speed internet connection or wi-fi out on the rangeland where my parents call home). My father warned me that his barber might have the day off, but that “one of the girls” would take me. When we arrived at the shop, we were greeted with a CLOSED sign on the door. My wife told me this would happen! Fortunately, we had just passed an open barber shop a few blocks away. Inside, three barbers were working away on customers while another family waited their turn. I sat down patiently and waited about 20 minutes to be called. This was definitely not a discount hair establishment like the place my father patronized. A sign advertised that a regular haircut would set you back $12. But I was there already and I just wanted to get this itchy stuff off my ears and face. I was not about to drive around looking for someplace less expensive. The last time that I had my hair cut back home, I told a young woman at a salon that I wanted a “3.” For at least 20 years, I’ve been familiar with the numbering system that many barbers use. Before I was married, I used to get a “one,” which is basically your Marine special. Just a bit of fuzz on top. My wife says that this style makes me “look like an escaped mental patient,” so I began leaving some hair on my noggin. I am now used to having the sideburns removed and keeping a reasonable amount of hair north of that. Still, I thought the “3” was a bit too short. Therefore, this time around I requested a “4.” “You know what a 4 is, right?” the barber asked. Yes, I assured him, I know what it is. Upon which I blinded myself by removing my eyeglasses and hoped for the best. The barber was a young guy who insisted that I used to be a tutor at his high school (I have never taught), urged me to get a lump on my head checked out (I explained how I obtained it forty years ago) and griped about how Heald College closed down when he had almost completed his associate’s degree and how Fresno City College wouldn’t transfer any of the credits. I should have told him that he missed his calling. He should have been a bartender. I wished I had the nerve to tell him to shut up and pay attention to what he was doing. At that point, the barber requested the details of my Thanksgiving. “Whad you grub on?” he inquired. I explained that my mother prepared the traditional turkey, cranberry sauce and potatoes, but that I very much enjoyed my eggplant and tofu, thank you. Welcome to the Marines, son. The other day I ran across an old article on salon.com (from back in July) that basically trashed almond milk as a poor nutritional and financial value, labeling the beverage as “kind of a scam.” While I don’t doubt the veracity of the nutritional breakdown cited by the article, I question the validity of its conclusions. And my cynical side makes me wonder whether the powerful dairy industry had anything to do with this article. Using a brand of almond milk called Califia as its example, the Salon article lists an eight ounce (one cup) serving as containing 1 gram of protein, one gram of fiber and five grams of fat. The article compares this to almonds themselves, only one ounce of which provide six grams of protein, three grams of fiber and 12 grams of fat. Well, if one ounce of almonds contains six grams of protein but eight ounces of almond milk contain only one gram of protein, hmmm… Indeed, the article goes on to conclude that a carton of almond milk is essentially “a jug of filtered water clouded by a handful of ground almonds.” This would seem to be a poor deal indeed. The superior nutritional value of almonds notwithstanding, the problem is that you cannot lighten your coffee very effectively with a handful of nuts. The Salon article admits to the increasing popularity of almond milk as an alternative to dairy milk (particularly among those who are lactose intolerant) and soy milk (which has gotten a bad rap due to allegations of health issues associated with the hormones in soy). I didn’t notice any mention of vegans, possibly for the reason that the purists among us tend to stay away from any almond milk that isn’t made at home. The reason is that most brands of almond milk that you find in the store are processed on commercial equipment that is also used for dairy products. For those of us who are also kosher: This is why the O-U hekhsher on almond milk, a pareve product, is nearly always followed by the infamous “D” (same thing with many brands of “nondairy” creamer). I’d like to refute the Salon article’s conclusions as somewhat misleading. As with so many things, context is key. I am not familiar with the Califia brand cited by the article, but it would be a mistake to assume that most commercially available brands of almond milk follow identical nutritional breakdowns. 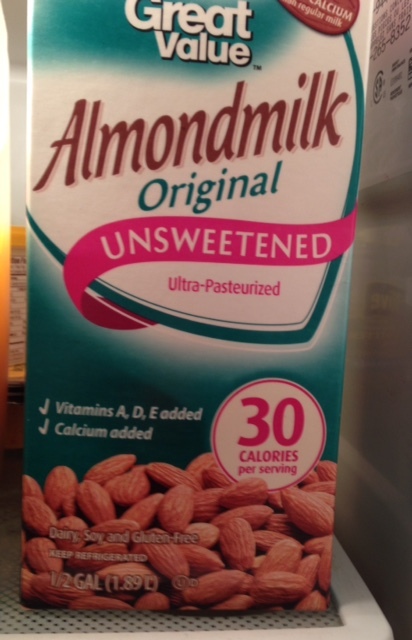 For example, the unsweetened almond milk that we typically purchase at Wal-Mart (sold under its Great Value brand name) presents a slightly different picture on the nutritional panel of its label. A one cup (8 oz.) serving contains the same one gram of protein as Califia and even less than a gram of fiber. Notably, however, Wally World’s almond milk contains only 2½ grams of fat per serving, half the fat content cited by Salon. I admire those who strain their own almond milk, thus skipping additives such as carrageenan (which, although made from seaweed, is now thought to cause all manner of gastrointestinal problems). But for those of us who are helpless in the kitchen (or who just aren’t interested), I submit to you that almond milk can be a useful product, particularly when used in moderation. During a typical trip to Wal-Mart, we are usually able to purchase a carton of unsweetened almond milk that is still about six weeks away from its expiration date. This is great, because that’s about how long it takes me to use it up. In fact, I often use the last bit even a week or two beyond the expiration date and it’s still fine. As you may surmise, I do not glug down almond milk by the glassful. I use it quite sparingly. It tops off my coffee, a beverage I rarely indulge in more than a couple of times per month. I am primarily a tea drinker, although I tend to garnish a steaming mug of tea with lemon, not milk. I also enjoy the fruit-flavored herbal teas that are great just as they are. I do, however, add almond milk when I drink Earl Grey. To me, there’s no other way to enjoy that royal English beverage. I also use almond milk in my oatmeal or shredded wheat, each of which I eat maybe once a month or so. About the only other use I make of almond milk is when my mother-in-law, a wonderful cook, makes me something special every few months (such as vegan versions of mashed potatoes or chocolate pudding). Oh, my, I do have a birthday coming up, now don’t I? All in all, I certainly see Salon’s point of view that almond milk might not be such a great alternative as a beverage of choice, particularly if you have kids in the family downing it by the glassful, day after day. However, as a top-off for coffee or tea, or in cereal or used to cook an occasional recipe, I find almond milk to be nothing less than a vegan’s friend. I drove into town to get the oil changed in our car today, and on the way home to the parsonage, I saw a family of six walking along the side of the road, every one of them decked out in red and white Santa hats. Every last one of them, including the baby in the stroller. Wow, so it’s really Christmas, huh? 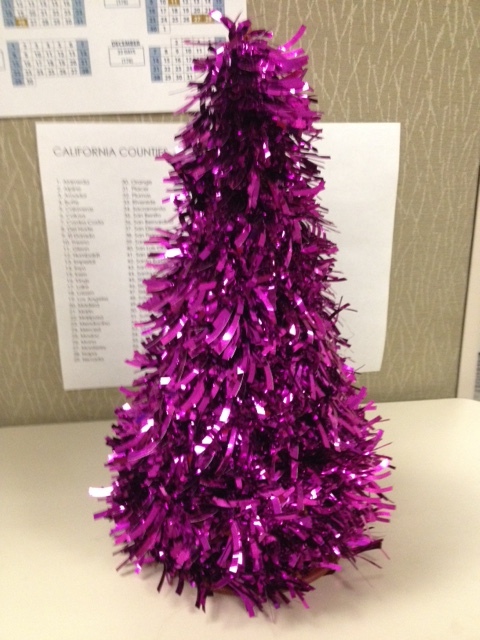 As a New York boy, it never seems as if it’s really Christmas here in northern California. The mild weather fools me every time. With all the falling leaves, it feels more like October. 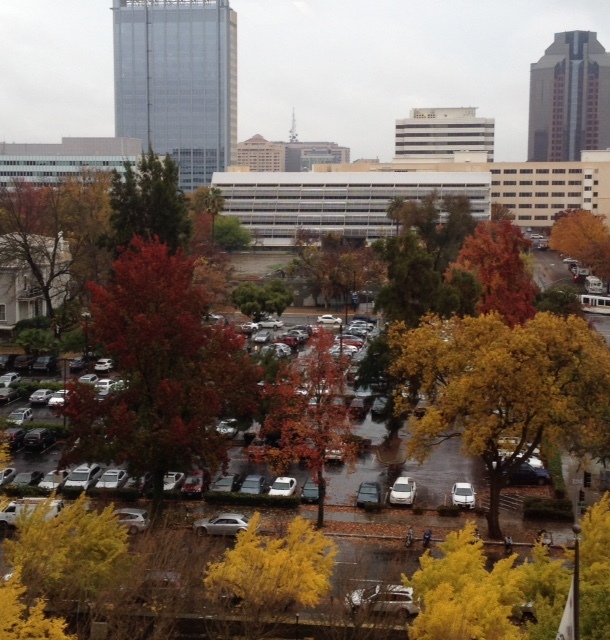 I took this photo of downtown Sacramento’s fall color from halfway up the office tower in which I am currently employed. All in all, this was quite a week. We started out on Sunday with brunch at one of our favorite Mexican restaurants. 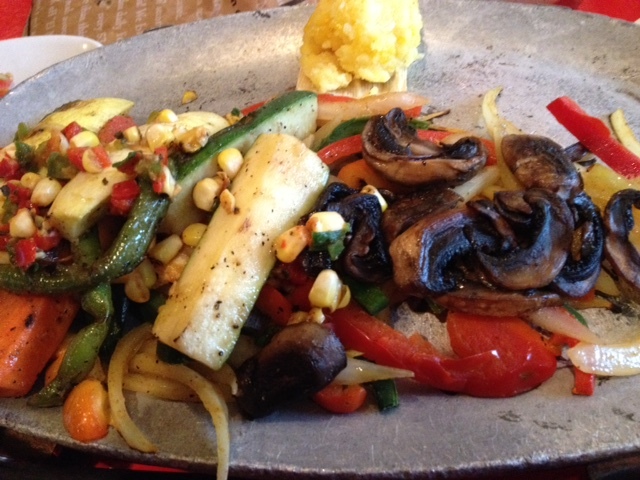 They have veggie fajitas right on the menu . 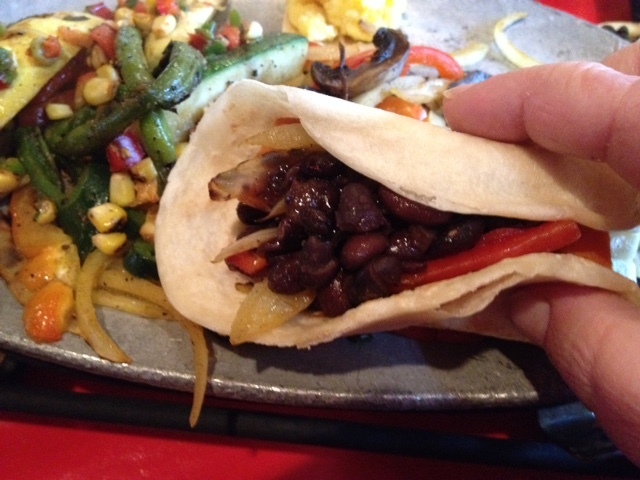 . .
. . .which I proceeded to make into tacos, thanks to the vegetarian black beans. This may not seem like such a big deal, but believe me, it is. It’s delightful for once not to have to ask the server to have the cook make up something special, and no butter (no, not even margarine), and by the way, what type of oil do you cook with? Congratulations, you have instantly become a problem customer. Just don’t admit to being a vegan, whatever you do. Better pretend to have severe food allergies. Or tell them that you’re an Orthodox Jew and have to follow the kosher rules. Hope they don’t ask you where your “Yamaha” is. (Out in the parking lot, doofus. It’s the one with the twin cams and the Star of David). 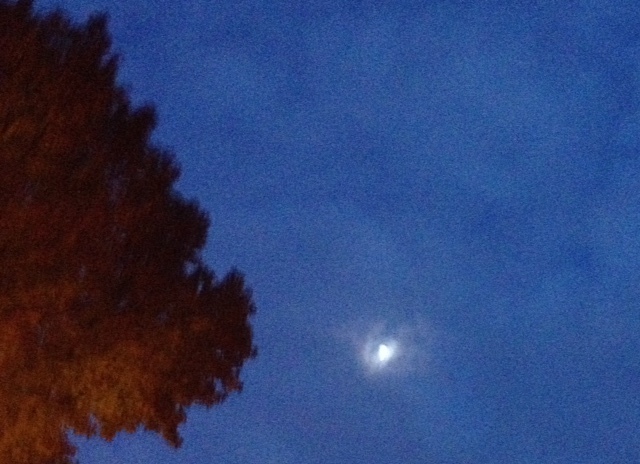 As I left work on Tuesday evening, the nearly full moon attempted to show itself through the mass of clouds that had been watering the fields and roadways all day. By Wednesday, immense puddles had formed all over the area. We had a brunch at work for an employee returning from maternity leave. I was able to help myself to orange juice and fresh fruit, and I brought in bagels for everyone to enjoy (along with some hummus as my personal substitute schmear for the cream cheese). I wanted pasta and hot soup for dinner, so I asked my wife to bring Pastor Mom along when she picked me up from work. We had a wonderful dinner (“Yes, the cook says we can make the sauce without cheese. Yes, you can have olive oil instead of butter with the bread.”) and made our way northward toward home without incident, despite the continuing rain. Thursday morning, many of my coworkers reported that they had a heck of a time getting home. One person who works on my floor talked about having seen four cars literally floating down the freeway. Welcome to California. Dry or wet, it’s always a disaster. 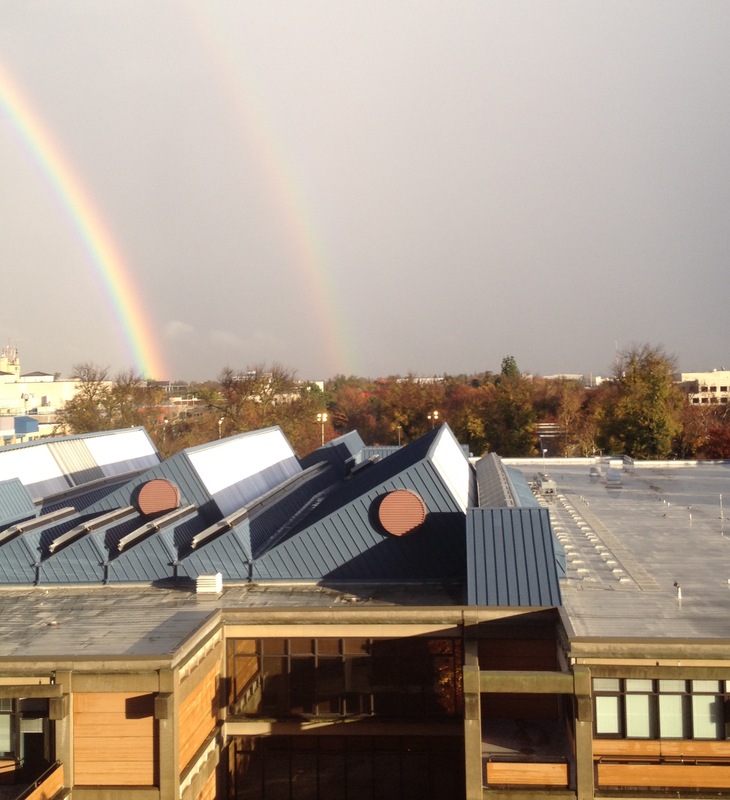 The photo does not begin to do this double rainbow justice. It was a huge arc that gave the appearance of wrapping all of Sacramento in a giant embrace. This was among the largest rainbows that I had ever seen, and I couldn’t help thinking that this was what Noah saw when God promised never again to destroy the world by flood. Brighter times ahead. Yes! Thursday evening, we all took my sister-in-law out for her birthday. We had a wonderful time (veggie tacos, hooray! ), my niece and nephews showed up, and my two year old grandniece was in high spirits. She wouldn’t stay in her high chair very much, so we passed her from hand to hand and only had to run after her once when she made her way down the steps and headed toward the restaurant exit. When it was time to leave, our dear little one, entirely unprompted, offered each of her hands to my wife and myself. 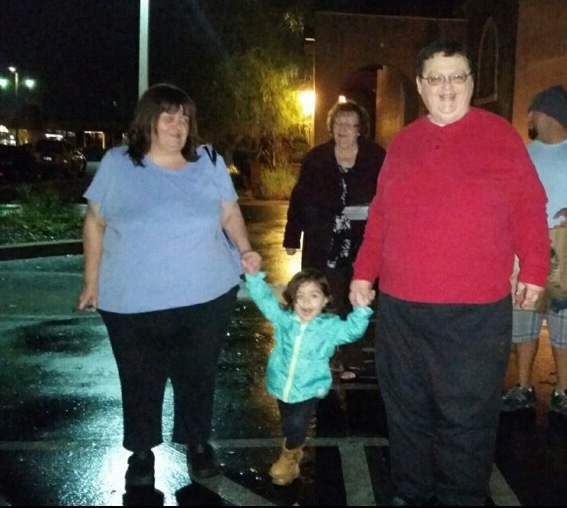 Hold my hand and walk with me, auntie and uncle. I will cherish this photo forever, my friends. Thursday night, I went to bed a happy boy. And so, life being what it is, things proceeded directly from the sublime to the ridiculous. Friday. Finally, the end of the week had arrived, so let’s go out with a bang, now shall we? I won’t get into the details of the Friday follies that transpired at work (I am shaking my head just thinking about some of it) other than to describe the celebration we had in honor of the birthday of one of my coworkers. On Thursday, some people were out, and those who were at work couldn’t decide whether we should have a brunch for my coworker or take her out to lunch. The last I had heard, it was decided that it was too last minute to do anything. And then on Friday, as noon approached, I was informed that we would be bringing in Vietnamese pho for lunch to celebrate my coworker’s special day. Did I want beef or chicken? Sometimes you don’t know whether to laugh or cry. Also, we had a meeting at which my boss (who is among the best supervisors I have ever had and whom I appreciate dearly) announced that he has found another job and is leaving. I think I’ll go with crying.